It is certainly clear from scripture that we have a great job ahead of us—to pray for all men. But why must we do it? And if we must do it, how do we get motivated to do it? Why do we have a responsibility to intercede for people? The answer is that God has made us responsible by making us His priests. As priests He has commissioned us and called us to intercede for all men. With this calling He has given us a desire deep inside us to intercede. And so, even though we may at times regret the hard work of intercession, deep inside our soul we secretly love it. Yes, we love to be involved with Christ in His work. For as His interceding priests we have the glorious privilege of ruling with Him and extending His rule. Hence, in no other way can we do more to advance Christ’s kingdom and bring glory to the name of Jesus then to intercede. It is our supreme service and the most Christ-like of all labors while we are on this earth. He has not only given us a desire to intercede for all men (in a general sense), but He has also channeled that desire for us, so that we have a desire to pray for specific individuals. And so He brings certain people to us, people that He wants us to pray for. He may bring them to us much like He brought the man on a long journey to the man in the house (Read Luke 11:5-13). Like this man we will feel a great responsibility for the one God sends our way. We must then go boldly, even if at midnight, asking God to supply their need. Probably the greatest sense of responsibility we feel in prayer is toward our own children. We feel this way because they are part of us, and we love them and feel their needs. We also feel this responsibility because we have a sense deep within us (whether we will admit it or not) that they have been given to us by God as a trust. And so this is why we have such a strong desire to regularly pray for them. God has also placed other people, besides our children, around us, and in our minds that we have a responsibility to intercede for. Everyone you meet or think about during your day you have some degree of responsibility for. Moreover, as God’s priests, since He has called us and given us a desire to intercede for people, we can be sure that intercession is our solemn duty, our job. Yes, according to 2 Cor. 5:20, God has made us ambassadors for Christ, in which intercession is always included. How to gain a sense of your responsibility to intercede. If we don’t sense this great responsibility, this duty, what do we do? I can think of three things to do. One, we can always pray for it. Pray that God would help you to feel this great responsibility to intercede for others. Two, you can seek God’s will on it. 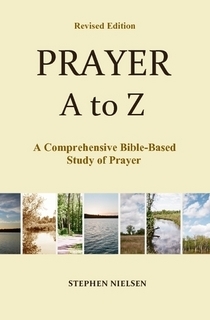 Read book and passages in the Bible on prayer and intercession. Last—and I think this will be most helpful—obey the Lord always. When He tells you to pray for someone, pray, whether you feel like it or not. Soon you will get that deep-down desire that was there all the time. This entry was posted in Intercession -- Parts 1-3, Prayer A to Z Excerpts and tagged 2 Corinthians 5:20, intercession, Luke 11:5-13, prayer. Bookmark the permalink.